Last week I read an article in Women's Wear Daily that I thought was well written, interesting and left me thinking. It was titled "Men are the new Women" written by Nick Graham, chief executive of NGO, Inc and founder of Joe Boxer. In the article Mr. Graham discusses the idea that men are starting to express themselves through fashion. Graham states; "It’s the Darwinian evolution that we, as men, are going through — crawling out of the primordial mud of tradition, moving toward an oxygenated world of choices about how we want to represent ourselves as our personal brand." Social media has helped launch the concept of personal branding and style, (through clothes and accessories) offer a quick glimpse and helps broadcast one's image better than anything else. Think about it, when you walk down the street, strangers don't know who you are, but they can tell a lot about you in how you present yourself and how you dress. Men, who once didn't care about fashion seem to be picking up on this concept. Mr Graham also goes on to mention that designers have not and do not currently offer men the lavish choices that are presented in women's wear. Sales in men's clothing and accessories online are 50% more than women's. He attributes this statistic to the fact that there just aren't as many offerings in a regular retail store. 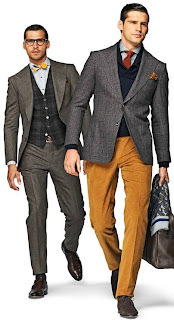 The vastness of the internet provides far more creativity when it comes to fashion for men. From experience, shopping for a man in a retail store is frustrating! All that seems to be offered are things in brown, black and possibly white. There is little color, no options, and no pizazz! It is no wonder that more men up to this point have not been interested in fashion, they have had nothing to choose from. My favorite quote of the article is: "This conversation is not about a new trend, but the launch of a new style. Style is like knowing someone all your life; a trend is having dinner with someone and never seeing them again." I completely agree with that statement. People tend to confuse trend and style all the time. Trends come and go, but style is innate. Style is the way one broadcasts who they are and what they like represented in the way they dress and it doesn't usually diverge much. Overall I thought it was a very thought provoking article. In talking to the men I know, most think they don't know anything about fashion. My response to them is: "always wear what you like and what reflects your personality". The fun thing about fashion is that, like art there are no real rules. The idea that ones shoes and belt have to match are just a guideline, no longer a rule. I encourage all the men out there to push the limit and create your own style...people will notice!